From a classic Hot Toddy to global mulled wine recipes, Hot Buttered Rum and spiked hot chocolate, consider these recipes your guide to surviving the cold. We’ve compiled a list of 11 of the best boozy concoctions to keep your core temperature up until spring arrives. From classics like Hot Toddy and Hot Buttered Rum (don’t knock it until you’ve tried it), to spiked hot chocolate and marshmallows, global variations of mulled wine and boozy coffee, these cocktails are guaranteed to light a fire in your belly all season long. This hot toddy variation balances the fresh, bright flavor profile Irish whiskey with touches of pumpkin, walnut and blackstrap molasses. The key ingredient here isn’t actually the whiskey, but nocino—a liqueur native to Emilia-Romagna region of Northern Italy, made from green, unripened walnuts. Previous hard to come by in the U.S., imported bottlings have begun to pop up at shops around the nation. But increasingly, American distilleries have begun producing their own versions of this classic digestif, with liquors ranging from vodka to rum acting as the base spirit. Look for domestic offerings from Skip Rock Distillers in Washington State, Watershed Distillery in Ohio, and Wood Hat Spirits in Missouri, for an updated take on an Irish Whiskey Hot Toddy. Combine all ingredients in a mug and stir until well incorporated. Garnish with a lemon twist. Though the first culture to heat up sweetened wine before spiking it with spirits and spices were the Romans in the 2nd century, it’s hard to argue that the Nordic countries have become known for perfecting it. 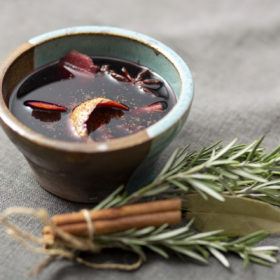 Mulled wine in Norway, locally known as gløgg, is a matter of particular regional of pride. What sets apart authentic Norwegian gløgg is the use of the country’s national spirit, aquavit, to spike the base. Make sure to take a look at our guide to aquavit for more information about this regional favorite and recommended bottles you can pick up stateside. Already familiar? Try tracking down one of these special-edition Christmas aquavits for a bold new taste. Heat the red wine slowly in a saucepot over medium-high heat. Put the cardamom, cloves, cinnamon and ginger in a spice bag and add to the pot. Stir in the sugar until it dissolves. Remove the pan from heat and let cool, approximately 2 hours. Add the aquavit to the pan and place over medium-high heat. Heat until just before mixture reaches a boil. Add raisins and almonds. Transfer mixture to a punchbowl, remove the spice bag and ladle into large glass cups with little spoons, scooping up raisins and almonds. Serves 8. 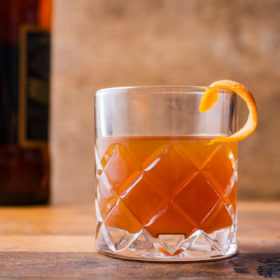 This Hot Toddy variation gains complexity from use of Amaro Montenegro, an Italian bitter known for its 40 herbs and botanicals. Demerara sugar, spiced rum and two types of bitters—including one aged in whiskey barrels—yield a drink that’s perfect for drinkers who find plain Hot Toddys to be thin, and prefer a bit more depth. If you’re a fan of big, bold red wines and dark beer, this is the Toddy that will bring the flavors you’re looking for. Combine all ingredients except the garnish into heat-proof mug. Garnish with an orange peel.